#London : London held Anti-repeat presidential demonstration. 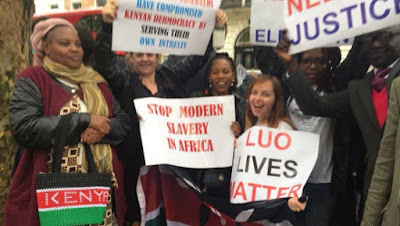 #LuoLivesMatter - Bana Kenya News, Real African Network Tubanane. People affiliated to Kenya demonstrated in London saying urging the leaders to stop ethnic profiling, especially in Nyanza. The also said the elections conducted in Kenya was Sham and urged the British government to intervene as its colony. "We have had west African countries chaos intervene by the french government and assist their people why not Kenya to be intervened by the British government?" a protester said. "We just saw the national flag being lowered and the entrance door shut when we started to assemble outside," said Geroge Osore, the chairman, and leader of the demonstration. Asked why they were demonstrating, Osore said: "We are protesting against the sham election going on in Kenya. We are saying we are not a party to it. We have seen innocent Kenyans killed. This is the start of resistance and civil disobedience." 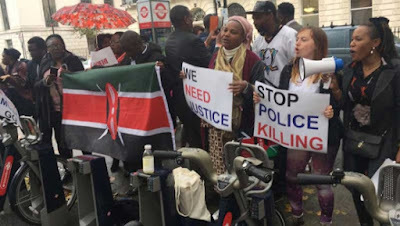 There were about 70 demonstrators waving placards with messages: "Uhuru must go", "We need justice" and "Stop police killings". Some were using hand-held loudspeakers during the protest at the embassy’s parking on the Portland Place. A statement read during the demonstration, which was licensed to be held between 2 pm and 4 pm, said the Independent Electoral and Boundaries Commission had failed to conduct the elections in a manner consistent with the Constitution and would not deliver a credible election. The statement urged the British government to intervene to end the crisis in Kenya by initiating dialogue among political antagonists. Kenya has been seen to be a strategic country in East Africa and now in this political turmoil, investors will shun away and the country will be struggling as already the economy is on its knees. Kenya has lost almost 70 Billion in the last one month due to the political heat.